Join us online, Thursday February 21, 2019 at 1:30 PM ET/ 10:30 AM PT for an e-lecture as a part of the series titled: “This Landbase is not Passive – Connecting Boreal Wetlands to Forest Management ” delivered in collaboration with Wetland BMP Knowledge Exchange, Ducks Unlimited Canada. 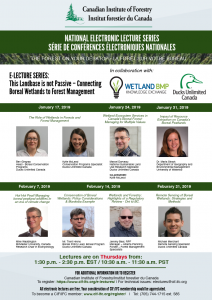 On February 21, 2019, Michael Merchant will present on “Remote Sensing of Boreal Wetlands: Strategies and Methods“. Please follow the instructions to register to online HERE.